Lineup Changes:Hershey - Nathan Walker was the odd man out for the Bears in Game 3. The suspended Liam O'Brien returned to the lineup, and his Game 2 replacement Dustin Gazley remained in for Game 3. Wilkes-Barre - D-Man Ryan Parent had to sit out with a lower body injury, and is listed as day-to-day. Parent, while paired with Barry Goers, has been excellent throughout the postseason. His absence was noticeable. Tyler Biggs replaced Sahir Gill, who is still coming back from surgery and not quite ready to play in a back to back situation. New Father Niclas Andersen returned after missing Game 2 to witness the birth of his first child, son Carl. Harrison Ruopp remained in the lineup due to the absence of Parent. loose puck near the faceoff dot, and made a nice backhanded pass to Dustin Gazley who was crashing towards the net. Gazley showed outstanding instincts by waiting as long as possible and slipping the puck just inside the post and behind Casey DeSmith. The questionable officiating began early in this one, as the referees made it clear not much would be tolerated calling 5 minor penalties in the first period, mostly of the "soft" variety. Second Period: The penguins began the second period by having to kill off a full 2 minute Hershey PP on fresh ice. Once again the killers were up to the task as they killed it off without even a threat from the Bears. 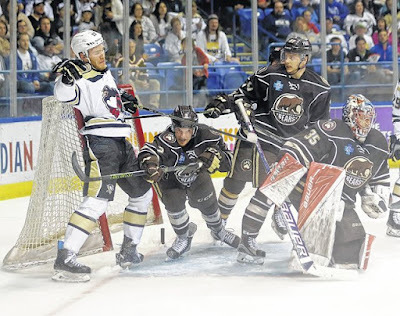 Up until this point Hershey had still not scored a PP goal in the series. Most of the period was played on special teams with the sides trading PP opportunities as the referees continued to crack the whip. 8 minor penalties in total, made it tough for either team to find a rhythm 5 on 5. The WBS PP was able to maintain possession and put some pressure on Justin Peters, but he turned them away time and again. Hershey's PK units were also continuing to clog up the shooting lanes much like they did in Game 2. The Penguins weren't able to make the adjustments and in turn could not solve the Hershey riddle. Rookie Daniel Sprong was struggling to find his game, and found himself stashed on the bench most of the 2nd frame. When he did play it was mostly on the 4th line with Blueger and Archibald. At the 12:34 mark of the 2nd, League MVP Chris Bourque unleashed a one-timer right off of a PP faceoff, and beat Casey DeSmith high to the blocker side. DeSmith never had a chance and the mighty Hershey PP was on the board. 90 seconds later Carter Camper torched the Penguins' Defense and slid a cross-crease pass to rookie Jakub Vrana who tapped it in, and just like that the offensively challenged Penguins were down by 3. Considering they had not scored on Peters since TK's empty netter late in Game 1, there wasn't much cause for optimism throughout The Mohegan Sun Arena. Shots after 2 were Hershey 18, WBS 16. The Penguins came out for the third period knowing full well that a quick goal was their only recipe for success. Instead they turned a puck over in their own zone, and Penguin killer Chris Bourque buried his second goal of the night to make it 4-0. Bourque let the Penguins faithful know how much he enjoyed scoring that goal with quite the over the top celebration. Bourque has been scoring timely playoff goals against WBS for a full decade at this point. The Penguins weren't going to quit, and Niclas Andersen left his point spot while crashing to the net and he banged home a good pass from behind the net by Jake Guentzel. It's a nice story for Andersen, he will be able to take the puck home to his brand new baby boy. There seemed to be some life, and the crowd was alive for the first time since the opening minutes. Liam O'Brien made sure it wouldn't last. The forward returned from his one game suspension for his hit on Dominik Simon late in Game 1, and certainly rubbed it in the face of the Pens. While Simon is watching from the Press Box, O'Brien is playing well and scoring goals. Following the 5th Hershey goal, Trisan Jarry replaced Casey DeSmith and was solid in his Calder Cup Playoff debut. The rest of the period was filled with fights, and roughing minors. Scrums occurred following every whistle, and at one point each team had up to 4 men in the sin bin. Jake Guentzel would score on a 5 on 3 to finish up the scoring for the night, Jeffrey and TK notched the assists. The final horn sounded and the Bears jumped over the boards to congratulate netminder Justin Peters on another stellar performance. Shots ended up 27-24 in favor of the Bears. 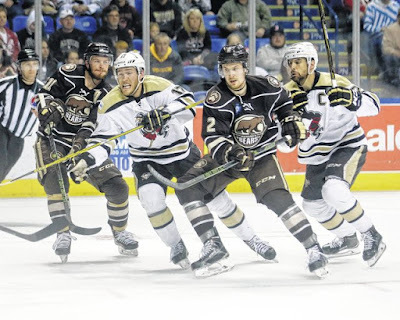 Postgame News & Notes:- League MVP Chris Bourque had just one goal entering tonight's Game 3, he netted a pair in the Game and now has 100 career points in the Calder Cup Playoffs. If this performance allows Chris Bourque to get hot, this series won't last very long. - The officiating tonight clearly indicated that the AHL wants to maintain control over this series. 29 infractions equaling 64 led to a parade to the penalty boxes. The WBS PP was 1/9 while the PK went 7/8. - The loss of Dominik Simon is clearly hurting the Penguins. Simon had the only playoff goal from the bottom 6 forwards, and without him the Bears have been able to match up much better. - The fairytale story of Casey DeSmith may have finally come to an end, as he was pulled in the third period after allowing 5 goals on 22 shots. Tristan Jarry appeared to be sharp in the 14 or so minutes that he played. I've said this before but I would be shocked if Jarry doesn't start Game 4 on Monday night. - Dustin Gazley now has a SH assist, and a Goal since replacing the suspended O'Brien in Game 2. He may have been the best player on the ice for the last two games, and he would not have seen the ice had it not been for the illegal hit on Simon. Credit Gazley for coming in and changing the dynamic of this series. 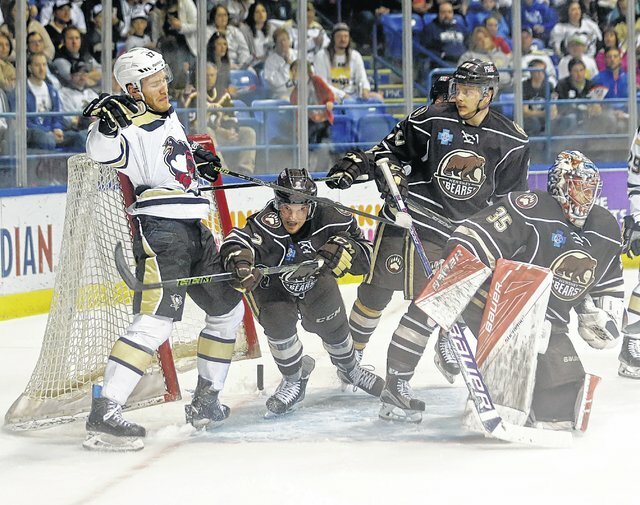 - As much as Hershey has dominated the past 2 games, a win Monday night and this series is all even at 2. If Jarry can match Peters and the Pens can find a way to get shots through the stifling Bears defense, there's a long way to go. 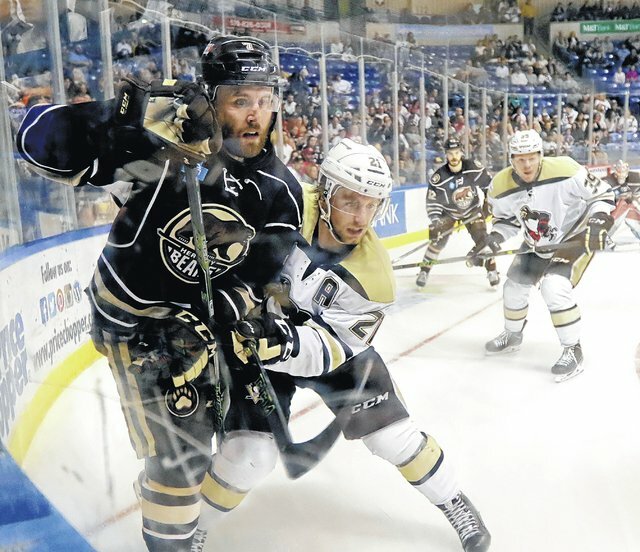 WBS has already proven they can win at Giant Center. - It may be time to give offensive minded rookie Dman Ethan Prow a shot. He hasn't yet played during this playoff run, but he has a lethal shot, and can really quarterback a PP. The Penguins need a spark, maybe he is the guy. - Daniel Sprong struggled tonight and found himself watching much of the 2nd half of the game. Let's not forget he is 19 years old and is leading the CCP in goals with 5. Donatelli would be wise to keep Sprong on the top line and playing minutes. Without his offense the Pens have very little else in the way of pure scorers. - Something is out of sorts with Will O'Neill. He broke the WBS Team Record for points in a season by a Defenseman, but has struggled mightily in both rounds thus far. WBS needs to get O'Neill going to stay alive in this series. 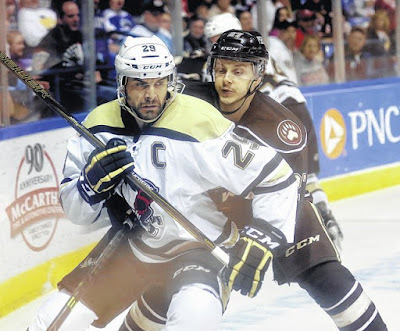 - Tom Sestito has been re-assigned from Pittsburgh and he played great against Providence in Round 1. If he can provide the physical presence and play good hockey (2A in RD 1) he can be a big piece to the WBS puzzle. Thanks for reading! Feel free to comment with your own thoughts, or look me up on twitter @jfoo1654.